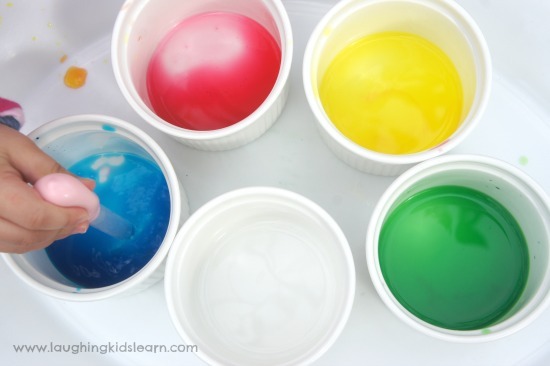 Here is an easy, fizzy science experiment for kids that requires only a few commonly found household ingredients. 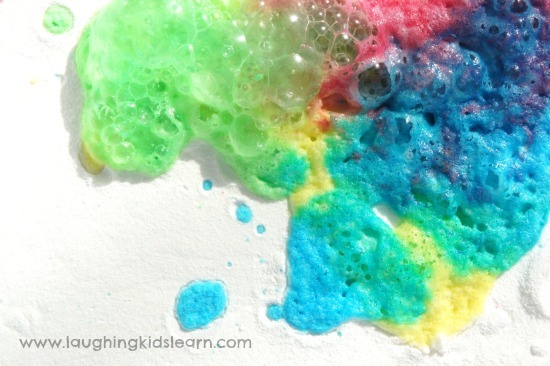 This science experiments, which uses baking soda and vinegar, teaches children about chemical reactions. 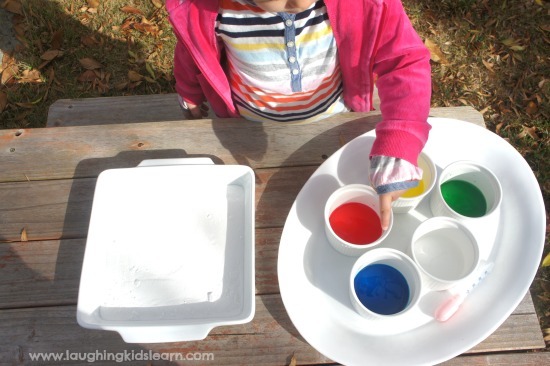 As children conduct this science experiment they also develop a greater understanding of colours while building on their fine motor skills. Kids love science. Their gasps as they witness a chemical reaction or surprising change is the best way to set their minds off into a flurry of questions and wanting to know more. 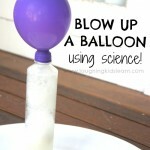 I also love that science, even easy experiments such as this one, can be enjoyed by children of all ages. 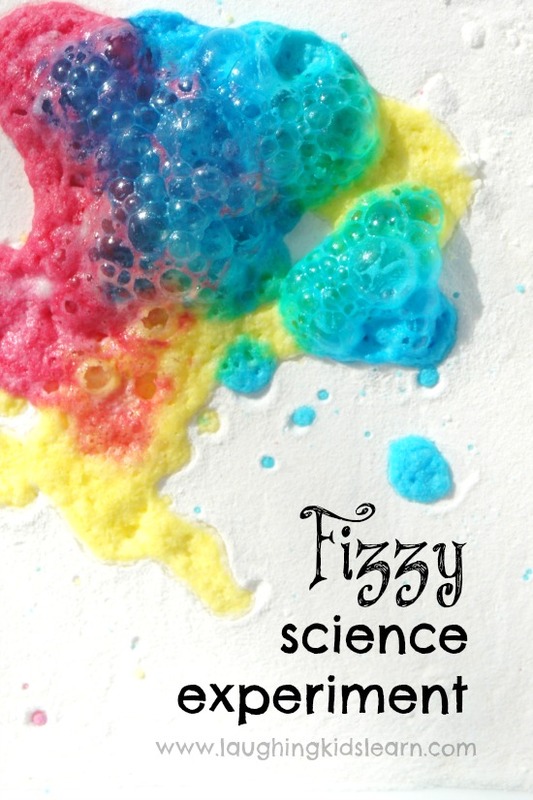 At first glance, this fizzy science experiment for kids doesn’t look like much. 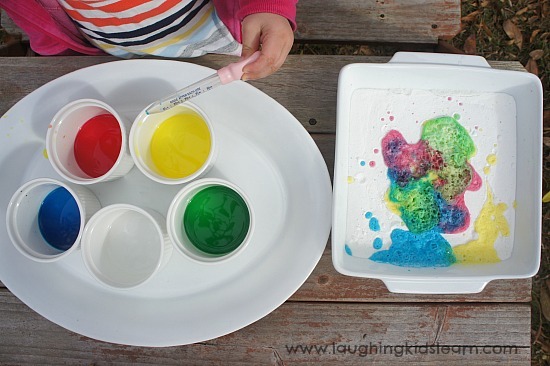 A baking dish with a layer of baking soda (or baking powder), some small bowls with 1/2 cup of vinegar with a few drops of food colouring and a dropper is all that you need. 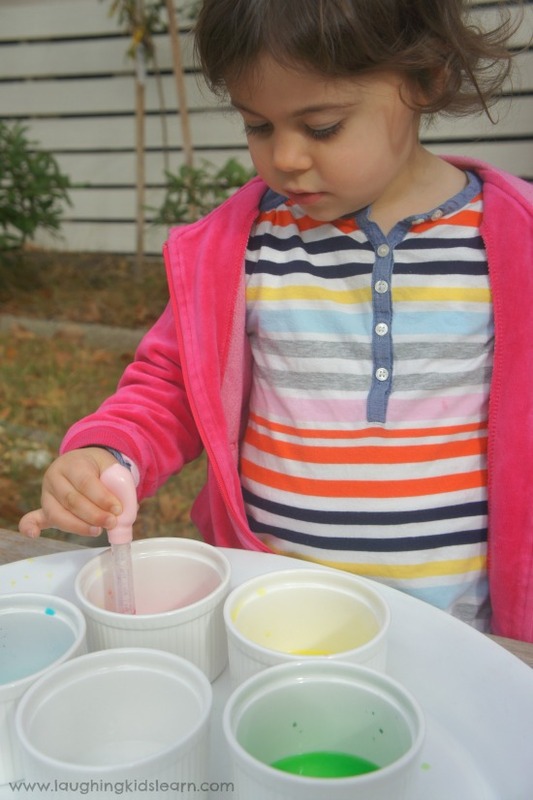 Before we started our fizzy science experiment, Possum (aged 3 years) enjoyed naming all the colours in each of the bowls. She also screwed up her nose when she used her sense of smell and got a whiff of the vinegar. 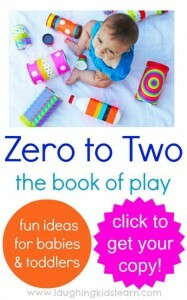 What a great way to test the senses. 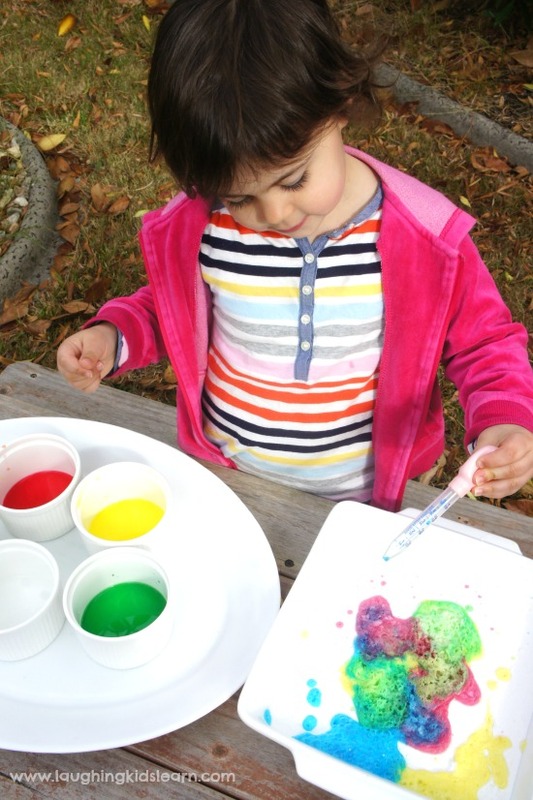 Droppers can be tricky for children, but it presented a really great teachable moment for us as we practised pinching the soft end of drawing up the liquid. 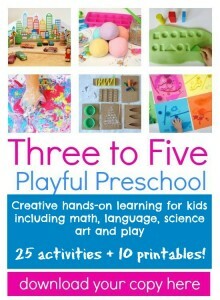 Droppers are also wonderful in developing fine motor skills. Possum certainly got better at using the dropper as the science experiment progressed. 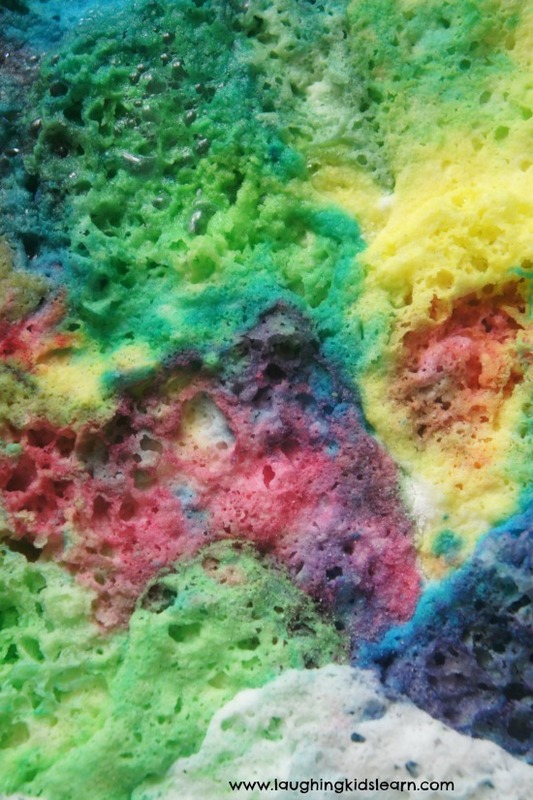 As soon as the coloured vinegar touches the baking soda a fizzy chemical reaction occurs. 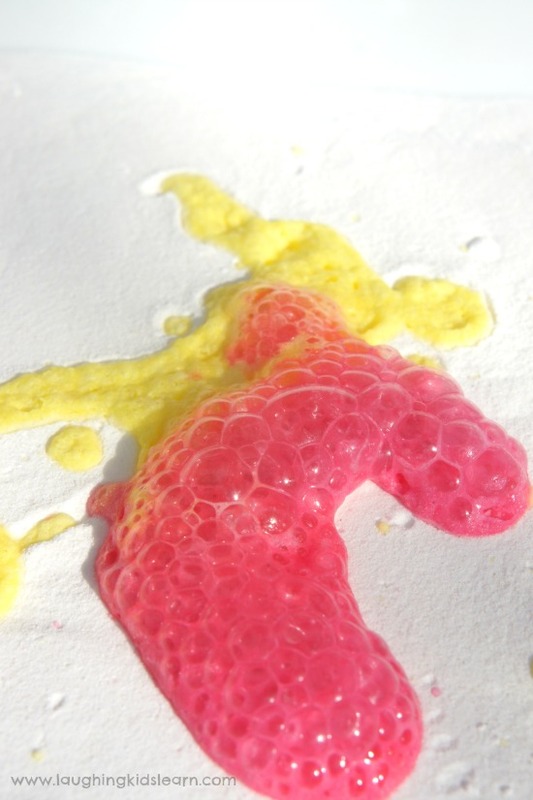 Colourful bubbles begin appearing immediately once the powder and liquid make contact. Seriously AWESOME! 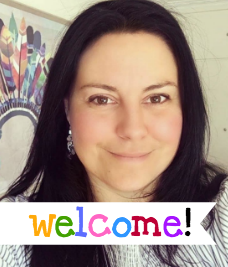 The colours mixed together really easily to create new colours. Possum and I had fun predicting, testing and experimenting what would happen when one colour mixed with another. It was lots of fun. So what is the science behind this experiment? Put simply, an acid-based reaction occurs when the vinegar and baking powder make contact. The vinegar is the acid and the bicarbonate in the baking soda is the base. I chose to explain it to Possum in the sense that the two ingredients really don’t like each other and so they react and create a gas, which is made and inside each of the bubbles. 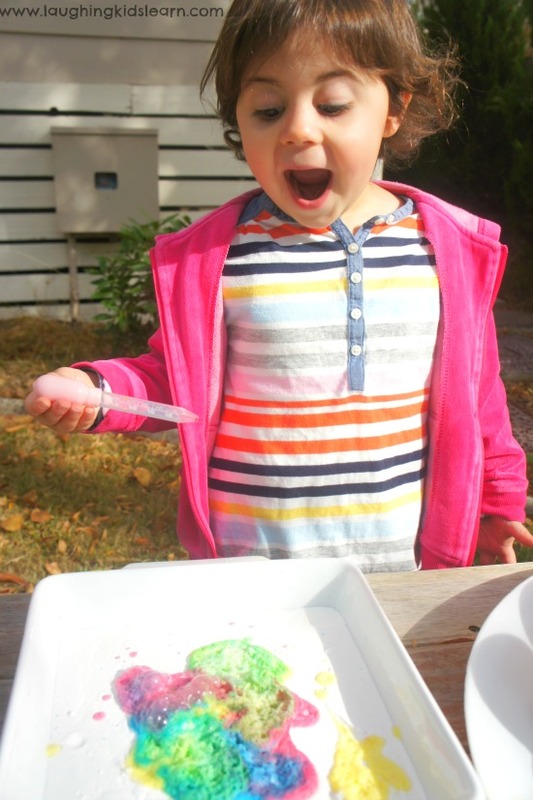 This fizzy science experiment for kids is a must do, we have actually done it a few times since this first attempt. It was super easy to set up, used only a few commonly found household ingredients and was a great introduction to some simple science exploration. I hope you find time to do it today. 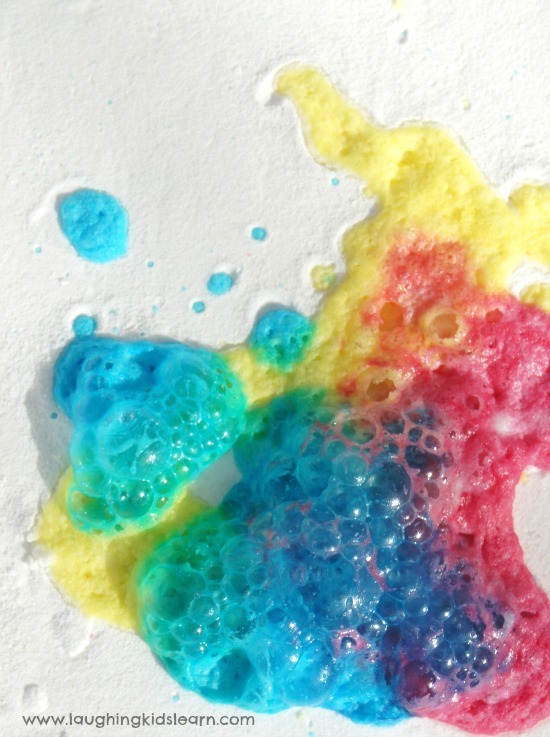 Would your child enjoy this fizzy science experiment? Love this. Great for my Grade R class.